I liked it more than I didn’t. “Hem hem”. 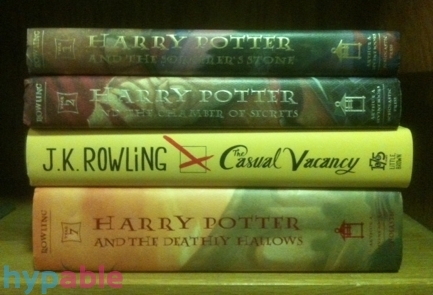 Before embarking on “The Casual Vacancy”, check-in those memory stuffed suitcases of “Harry Potter” at the cupboard under the stairs. There will be no need for wands, muggle! No need for robes, and certainly, no need for magic. Well? Tut tut—off you go! Ah, but crisp foil condoms, slicing silver razors, and fags for habit, ah yes, a shabby pocket of those will do just fine for your claustrophobic stay in the little country town of Pagford, the central occupant of “Casual Vacancy”. J.K. Rowling’s new novel for adults (now I know why), or as she calls it “for grownups”, is a different species of text altogether. Devoid of a central character/hero, “Casual Vacancy” begins with Death’s wet kiss on Barry Fairbrother, a well-known citizen of Pagword. From the moment you hear the thud of his heavy flaccid body hitting the ground in Chapter 1, the strands of Rowling’s narrative eject in every direction like the spinning of a clear neon spider web beginning to expand outward from the in. As you may have gathered, I idolize Ms. Rowling. Yet, infatuation does not dent my capacity for objective literary criticism. That said, let’s move on yes? The narrative is shiftingly omniscient, swirling and transforming like smoke through its breathing characters, possessing the text with different voices not by the succeeding chapters but by the succeeding paragraph. Each strand is a plot entwined with a close nucleus family of characters but also intertwined with their inescapable nosy neighbors. The shifting narrative voice allows glimpses into the characters’ mental clockworks, leaving us to judge their judgments in order to gain insight into their inky souls. The setting is local, but the theme socio-political, therefore, global. The end effect of the overarching theme, however, is yet to be determined. Has Rowling done enough in this dark comedy to make readers look beyond the microcosm of England’s Pagford, and extrapolate Rowling’s larger social views? Stylistically, the novel proves satisfactory but admittedly, not a masterpiece. Rowling still retains her sniper-ish talent to laser in on the human condition, especially for young adults for she is still more than able to Krystalize the emotions of her characters. There are lines in this novel etched by Rowling’s inked spear that will make you sigh with satisfaction, metaphors and similes used so deftly, it were as if Rowling, wand in hand, were slicing out a David from marble at her leisure. And yet, the language was not enough to make it a page turner at the start. The pace turtles at the onset, battering the reader with a laundry list of character names and detailed exposition to get acquainted with the whose-who of over 25 characters. This delays the reader’s later investment in the lives of these characters which occurs mid-way through, taking off like a Comet 360. And yet, people may not like this book. The fact that I’m left on the fence or only a bit tipped over in favor of it is telling enough. It is grim, gloomy, glum and depressing. It’s as if Rowling took her paintbrush and soaked the fibers in a palette full of English weather and started blotching mixed grey strokes on her writing canvas. Apart from my proclivity to always jab at England’s weather, the book becomes less appealing to the reader because it lacks the warmth of the Potter books, and this should be expected. There is serious social commentary in the story, very real insights into the world of class distinctions and biases, snide trials of latent racist thought, alongside the reality of abuse both sexual and physical. It is sardonic yet real; comic yet tragic; casual yet vacant. The problem is, how many people really want to read about that? The minutia of local town politics, is that enough to make us care? Evidently, it proves good for interesting gossip within the text. At every given moment we know who did what for the most of it, there is no mystery in that sense, the driving urge to keep reading is not knowing where are we being led to? Reviews have considered it “dull”. Is this because of Rowling’s craft or because of the subject matter at hand? Other reviews have been glowing appraisals of Rowling’s writing capacity. The verdict is not yet final, it is ambiguous for this very reason, it is what you make of it and how willing you are to be led into this world where happy endings exist only in pockets, if at all. Or is it that happy ending or not, something else allows a text to be more memorable and empathetic? Personally though to me one of the turn offs was the use of contemporary references. Seeing Facebook mentioned, and Rihanna’s Umbrella being the key cyclical chorus of the novel is intriguing yet disturbing. Firstly, it is not only that I didn’t think, ever, that Rowling listen’s to Rihanna, but secondly, such real-life young references seem to jar the fictive world. I know this is not Harry Potter, and hearing Hermione say she got a wall post from Ron would be sacrilege, but still, I guess I found it a bit touchy seeing those workings in this world of Pagford. Yet its purpose is indispensable. In a magic-less world, our world, it draws attention to the ever evolving world of technology and also the capacity of power held by one generation over the other. We are the most powerful generation in human history because of that very power, that none can wield technology comparative to the likes of us. While the subject matter is indeed deeply dark, and the characters drawn out quite well, there wasn’t a character that really stood out as ah-mazing! That memorable character, the stuff made of legends like Heathcliff, Fagin, Darcy or Snape. I might have raised a few hundred eyebrows for stitching in Snape into that sentence but yes, I do think Snape is a terrific literary figure. That’s not to say that the cast of “Casual Vacancy” was not 3D, but that something didn’t click. I wish I could have cared more, because these characters did deserve it more than the Potter gang. Perhaps, I didn’t because Rowling’s draws them with heightened realism for they are sharply imperfect, flawed, and too real. They possessed complex mental processes and yet I wonder why I felt a thin barrier of disconnect, invisible to me but still perceivable like a sheet of glass film. Apart from disconcerts, however, I thought Fats’s character was very intriguing. His philosophy of the authentic and the inauthentic was very promising indeed, and could have much to do with philosophic explorations. One of Rowling’s stylistic gems is her use of dialogue. “Casual Vacancy” is also blessed with that brilliant dialogue that is so real you can unthinkingly engage and believe in their voices as if you always knew that’s how they speak. I loved the dialogue used for Robbie, he’s a darling. She had never felt the slightest physical attraction towards him. What was love, after all? thought Parminder, as a gentle breeze ruffled…was it love when somebody filled a space in your life that yawned inside you, once they had gone? The New York Times’ book review is scathingly harsh, yet its mistake, its bias, is evident from its very title. Magic-less is not an excuse for being critical about this book unnecessarily. Cut away the “Harry Potter” before cutting away casually. “I would have nothing to say to the person who didn’t cry at the end of this book. Nothing:” J.K Rowling. Thankfully now I know I can speak to her in the future. The Guardian describes it more fairly as “intelligent, workmanlike, and often funny” while the Wall Street Journal is bounteous in its praise, identifying it as “like the fast-moving river that winds through Pagford is an extended authorial plea to notice and respect that other people are real—as real as we ourselves—however unimportant or peripheral they may seem. In the words of Colin’s wife, Tessa, we ought ‘to appreciate that behind every nondescript face [lies] a wild and unique hinterland’ like our own”. Indeed. 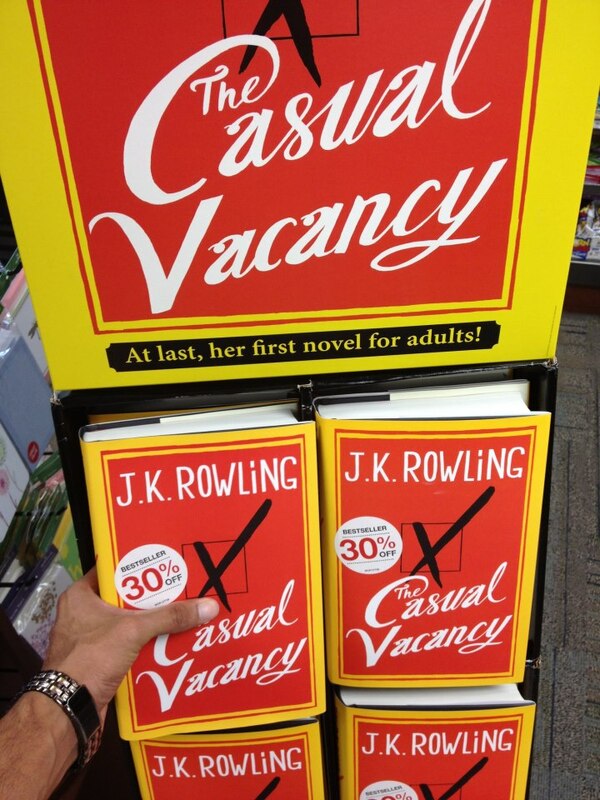 Regardless, “The Casual Vacancy” is a must read for your own judgment. I liked it more than I didn’t. It is Rowling after all and much more brilliance can be expected from her in the future. The final review then? 6.7 / 10. Adieu. The fact that there wasn't a speck of Rowling's style in the dark-humored literary volume dearly anticipated by many, suggests one of having done an exceptional job at being an author. And to know that the fiction itself didn't disappoint; being put mildly, I absolutely adored every instance, character, scene and the final outcome gathered. Hats off to you, Jo.My first badge of gratitude: our dear Flipkart. I received my order ON the date of release, which was more than I'd dared to expect.Well, it might not be easy to lay down precise words to summarize all of which one can garner out of the terrific and colossal novel; ranged with a deep scrutiny into the life of not one but many characters. There's a deep insight into their lives and minds, which is an incredulous achievement in itself. To portray that many people with unperturbed justice….And to top all of that, you know you've fallen in love with it WHILST reading, when you're dreading that it'll after all, come to an end.One can only serve it with much deserved credit by reading it with absolute cognition. I can't begin to spell out how much I've been inspired and in so many ways. It's not Harry Potter, it's an entirely different bittersweet piece of art. Just read it.